Lentils deserve an important place in our daily diet. They are a rich source of essential nutrients which is beneficial for our health, growth and weight loss. Lentil is a very nutritious aliment which must be included in our daily diet. It’s easy to prepare and fast to cook. In this article you can discover and try a tasty recipe of Indian dhal or red lentils. It reduces risk of cardiovascular problems. Lentils contain antioxidants that belong mostly to the large family of flavonoids. They are mainly catechin and procyanidins. According to some observations, when lentil is soaked or cooked, the number of catechin increases. Lentils are rich in fibre: boiled lentils are a good source with 4.5 grams of fibre per serving of 125 ml (1/2 cup). Soluble fibre contribute to cardiovascular disease prevention as it reduces the absorption of bile acids which helps to stabilise cholesterol levels in the blood. Lentil is an excellent source of phosphorus, manganese and copper. As a constituent of many enzymes, copper is necessary for the formation of haemoglobin and collagen (protein used for tissue reparation) in the body. Magnesium found in lentils helps in bone development and construction of proteins, prevention of muscle contraction, functioning of the immune system and improves dental health. It also plays a role in energy metabolism and in the transmission of nerve impulses. Lentil is an excellent source of folate which is involved in manufacturing all body cells, including red blood cells. An adequate intake of lentils is essential during periods of growth and development of the foetus because it helps in the production of new cells. Lentils are also a good source of potassium. In the body, potassium is used to balance the pH of the blood and stimulate the production of hydrochloric acid by the stomach which helps in the digestion process. In addition, it facilitates the contraction of muscles, including the heart, and participates in the transmission of nerve impulses. Lentil is a source of vitamin B1, B2 and B3. This vitamin is also known as riboflavin. Vitamin B1 plays a role in energy metabolism of all cells. It contributes to growth and tissue repair, production of hormones and red blood cell formation. Vitamin B3 is involved in many metabolic reactions and contributes particularly to the production of energy from carbohydrates, lipids. It also collaborates in the training process of the DNA, allowing normal growth and development. Lentil is also a natural source of vitamin B6. This vitamin, also called pyridoxine, is part of coenzymes involved in the metabolism of protein and fatty acids and the synthesis of neurotransmitters. It manufactures red blood cells and allows them to carry more oxygen. It also contributes to the smooth functioning of the immune system. Finally, this vitamin plays a role in the formation of some components of nerve cells and in modulating hormone receptors. Lentil is also beneficial for those who want to lose weight. It is a leguminous plant which contains virtually no fat. It is therefore very light. Lentil is full of complex carbohydrates which is quite filling and hence it prevents us from eating between meals. It also provides a great number of vegetable proteins. Wash the lentils 2 or 3 times. Put in a saucepan, add about one litre of cold water, turmeric and 2 bay leaves and simmer for about 20 minutes. Lentils must be tender. Once cooked, it turns yellow. Add salt to taste and set aside. Heat the sunflower oil or unsalted butter (about 2 tablespoons) in another container. Once the oil is hot, add and fry slightly the cumin seeds (along with dry red chilli) for few seconds. Add chopped onions and ginger, fry till light brown. In the end, add chopped tomatoes and mix vigorously for about 2 minutes. Pour this mixture on the preparation of lentils. Decorate with fresh chopped coriander or parsley leaves and finely chopped onion. Serve hot with rice and other vegetables or meat preparation. So try this tasty and nutritious Dhal recipe and enjoy with your family and your guests. Bon appetit. 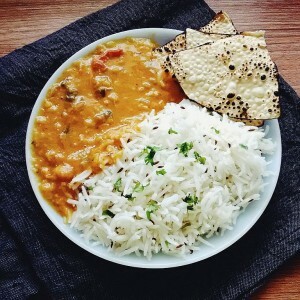 Dal Tadka served with rice and papad, staple meal in South Asia. Toor dal, i.e., yellow pigeon peas, is available either plain or oily. It is called thuvaram paruppu in Tamil Nadu, “Thuvara Parippu” in Kerala and is the main ingredient for the dish sambar. In Karnataka it is called togari bele and is an important ingredient in bisi bele bath. Toor Dal is called kandi pappu in Telugu and is used in the preparation of a staple dish pappu charu. It is also known as Arhar dal. Chana dal is produced by removing the outer layer of kala chana (black chickpeas) and then splitting the kernel. Although machines can do this, it can be done at home by soaking the whole chickpeas and removing the loose skins by rubbing. In Karnataka it is called kadle bele. Other varieties of chickpea may be used, e.g., kabuli dal. Yellow split peas are very prevalent in the Indian communities of Fiji Islands, Guyana and Trinidad, and are popular amongst Indians in the United States as well as India. There, it is referred to generically as dal and is the most popular dal, although masoor dal and toor dal can be used. It is prepared similarly to dals found in India, but may be used in recipes. Mung dal or moong dal, split mung beans, is by far the most popular in Bangladesh. It is used in parts of South India, such as in the Tamil dish ven pongal. Roasted and lightly salted or spiced moong dal is a popular snack in most parts of India. Urad dal, sometimes referred to as “black gram”, is the main ingredient of the Tamil Nadu and Kerala (South Indian states) dishes idli and dosa. It is one of the main ingredients of East Indian (Oriya and Bengali or Assamese) bori, sun-dried dumplings. The Punjabi version is dal makhani. In Karnataka, it is called uddina bele. It is rich in protein. Masoor dal is split red lentils. In Karnataka, it is called kempu (red) togari bele. Rajma dal: split kidney beans. Mussyang is from dals of various colours found in various hilly regions of Nepal. Panchratna dal (“five jewels”) is a mixture of five varieties of dal, which produces a dish with unique flavour. 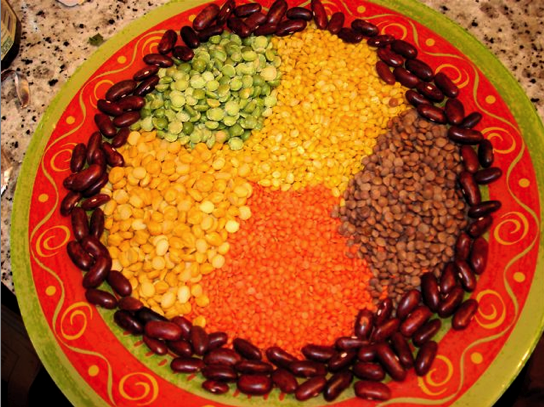 Pulses may be split but not hulled; they are distinguished from hulled dal by adding the word chilka (skin).